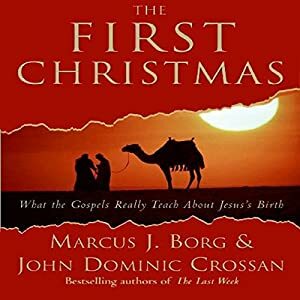 In this fascinating little book, Borg and Crossan explore the historical meaning behind the birth-of-Jesus story. They first point out the factual differences between Matthew’s and Luke’s versions of the birth story. Then they explain how, after the Enlightenment, many people want everything to be either literally true or false. Many Christians are in denial of the “factual inconsistencies” in the Bible, and the ones who are aware of the inconsistencies often feel a little uncomfortable and don’t know quite what to think about them. Borg and Crossan point out that the stories are meant to be parables. They were not meant to be taken as literal truth. They explore a deeper truth within the limits of historical culture. Borg and Crossan study (practically line-by-line at times) each birth story separately, explaining the cultural, literary, or mythological meaning of the Biblical text. For instance, in his story of the Magi and Herod, Matthew was bringing to mind parallels to the Moses story in his Gospel. Like Pharaoh, Herod wanted to kill all the baby boys because he’d heard that one was born who would overthrow him. As with the parents of Moses, Jesus’ parents had divine inspiration to have a child despite great obstacles – in the case of Moses’ parents, they had to have faith that their son wouldn’t die; in the case of Joseph, he had to have faith that Mary was yet a virgin. Against all odds, both boys survived and became great leaders. Such parallels to the Moses story would help justify to first century Christians the divinely-inspired leadership of Jesus. I really enjoyed learning about the cultural reasons for the choices Matthew and Luke made while writing their gospels. At times, I felt the book didn’t translate well to audio, though, because the authors went into great detail in their lists of gospel references (for instance, every reference of to Jesus as “light,” and what the word “light” meant in that sense). The lists didn’t translate well to audio since they were something I would normally either skim over or use as a Bible study guide. Neither could be done in an audiobook. Regardless, I’m glad I had the chance to listen to this book, and I hope to read their first book The Last Week. I’ll save that one for Easter, though. Next Post Merry Christmas One and All! I know a little, but just a little about the origins of the Gospels. I would like to know a lot more. Yes, I also am very interested in Gospel / Jesus history. If only I had the time to read all the books that are on that particular TBR list!